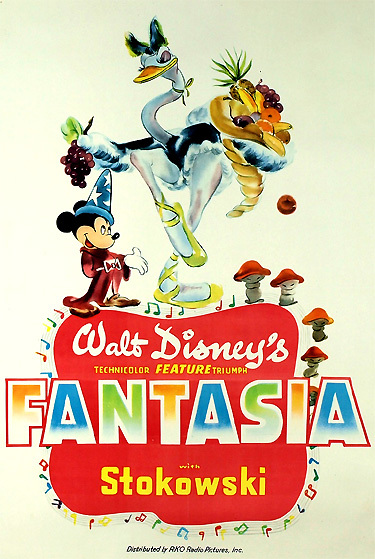 Fantasia (1940), a Disney animated feature-length "concert" film milestone, is an experimental film integrating eight magnificent classical musical compositions with enchanting, exhilarating, and imaginative, artistically-choreographed animation. The conceptual framework of the individual pieces embraces such areas as prehistoric times, the four seasons, nature, hell/heaven, the themes of light vs. darkness and chaos vs. order, dancing animals, classical mythology, and legend. This Disney production was an ambitious experiment to try to popularize classical music, especially by accompanying it with animation. Originally, the film was to consist of only The Sorcerer's Apprentice segment, but it was expanded to include the full anthology of shorts. Other segments, such as Ride Of The Valkyries, Swan of Tuonela, and Flight of the Bumblebee were storyboarded but never fully animated, and thus were never put into production for inclusion in future Fantasia-style releases. It introduced a very expensive, "Fantasound" 'stereo-like', multi-channel soundtrack (an optical 'surround-sound' soundtrack printed on a separate 35mm reel from the actual video portion of the film). The film received a special certificate at the 1941 Academy Awards for its revolutionary Fantasound (early stereo or 'surround-sound'). The film, with a production cost of more than $2 million (about four times more than an average live-action picture), initially failed at the box-office (partially due to the expensive installation of "Fantasound" sound reproduction equipment in theatres), but then its popularity increased and its cult status was assured when the members of the 60's drug culture adopted it as a favorite hallucinatory experience when it was re-released (alongside other counter-cultural, head-tripping favorites, including 2001: A Space Odyssey (1968), Easy Rider (1969), and the re-released Alice in Wonderland (1951) in 1974). Because of the studio's financial difficulties, its next animated feature, Dumbo (1941), was a low-budget offering. Ludwig van Beethoven's Fifth Symphony, a computer-animated sequence with fluttering triangles/butterflies, etc. A variation on this type of film was Disney's own 'unofficial' sequel Make Mine Music (1946), its 8th full-length animated feature, that substituted pop music for the classics. Two of its most famous segments (of ten animated vignettes) were (1) Prokofiev's Peter and the Wolf (narrated by Sterling Holloway) [distributed with the re-release of Fantasia in 1947 as an 'update'], and (2) Casey at the Bat. Another of the segments, Blue Bayou, was originally set to Debussy's Claire de Lune and was intended to be included in Fantasia, but it was cut due to length. There have been at least two satirical Fantasia spoofs: (1) WB's A Corny Concerto (1943) with Elmer Fudd impersonating Deems Taylor introducing animated shorts (Tales from the Vienna Woods and the Blue Danube), and (2) Bruno Bozzetto's Allegro non Troppo (1976) with six famous classical musical pieces visualized by a live-action story and animation (Debussy's Prèlude à l'après-midi d'un faune, Dvorak's Slavonic Dance, Ravel's Bolero, Sibelius' Valse Triste, Vivaldi's Concerto in C-Dur, and Stravinsky's The Firebird). What you're going to see are the designs and pictures and stories that music inspired in the minds and imaginations of a group of artists. In other words, these are not going to be the interpretations of trained musicians which I think is all to the good. The resident presenter of the NY first explains that there are three kinds of music: music that tells a definite story, music that paints a series of pictures, and "absolute music" that exists simply for its own sake. 1. J. S. Bach's Toccata and Fugue in D Minor. that might pass through your mind if you sat in a concert hall listening to this music. At first, you are more or less conscious of the orchestra. So our picture opens with a series of impressions of the conductor and the players. Then the music begins to suggest other things to your imagination. They might be, oh, just masses of color, or they may be cloud forms or great landscapes or vague shadows or geometrical objects floating in space. Taylor's introduction concludes with the figure of Leopold Stokowski moving center stage to mount the podium and call attention with his hands to orchestral members. As the piece begins, sections of the orchestra - shadows of the players including violinists, cellists, and French hornists - light up to emphasize their playing, against other colorful backdrops. After the opening Toccata, images of the orchestra's instruments and players turn more abstract and bizarre in the Fugue. The ends of violin bows become silver streaks darting through the heavens. Clouds and sky cover the screen. Music is projected as yellow streaks of light. Abstract forms and shapes (concentric circles, patterns, waves) move in a lively fashion, synchronized to the musical tones. Strings are suspended in air played with soaring bows. Discs or wafers resembling objects in space appear and disappear. As the music builds, sparkling bits of fireworks dance and explode in a metamorphosis of light and color. The piece concludes with a huge, orange sunset, over which is superimposed the black silhouette of conductor Stokowski - and then it all fades to black. You know it's funny how wrong an artist can be about his own work. Now the one composition of Tchaikovsky's that he really detested was his Nutcracker Suite, which is probably the most popular thing he ever wrote. Incidentally, uh, you won't see any nutcracker on the screen. There's nothing left of him but the title. Dance of the Sugar Plum Fairies: multi-colored fireflies turn into tiny sparkling blue Dewdrop Fairies and dragonfly sprites who dart and flit among flowers, touching them with their wands and spreading sparkling dew droplets across the forest. As buds open, more little fairies are awakened. A spider web is illuminated by the dazzling bits of moisture. Three sprites collide, producing a white explosion of dew drops that fall on red-topped mushrooms. Chinese Dance: six red-topped mushrooms shake off the dew, then become wide, coolie-hatted Chinese men with round heads, long robes and pigtails that are choreographed into a dance. Hop Low, smaller than the rest of the mushrooms, cannot keep up with the steps and routines of the larger mushrooms. He hops back into place just in time to take a final bow. Dance of the Reed Flutes: multi-colored flower petals and blossoms spin and drift downward to the surface of a stream. On the water surface, their petals spread out and they are transformed into tiny, wide-skirted ballerinas. A breeze sends them spinning across the water surface and among the branches of overhanging trees, until they are swept over a bubbling cascade and vanish. Arab Dance: underwater bubbles from the cascade rise gracefully to the surface where the flower blossoms vanished. Underwater, in a forest of undulating water plants that becomes a harem, exotic gold and black fish with long flowing tails create beautiful patterns in an aqua ballet. The goldfish become coquettish chorines with pink eyelids and fluttering lashes. Bubbles again rise to the surface at the end of the sequence. Cossack/Russian Dance: one thistle with six pink blossoms bursts from the largest bubble, becoming six separate, Russian-looking, mustached, high-kicking thistles. More groups of thistles join the dance, spinning and dancing with groups of orchids that resemble slim-waisted peasant girls with full skirts and quaint headdresses. The pace gets faster and faster until it freezes on a final tableau. Waltz of the Flowers: the change of seasons from fall to winter is beautifully illustrated in four dances. (1) Autumn Fairies fly among the trees, touching green leaves which take on yellowish-brown fall colors. The leaves drop from their branches and drift with the wind. (2) The Autumn Fairies also touch milkweed pods which burst, releasing their silky milkweed seeds. The seeds resemble classical ballerina dancers with white bouffant skirts and smooth, sleek black hair. (3) Bluish Frost Fairies decorate nature with tiny needles of bluish white ice. They skim and skate across the surface of the pond, changing it to ice and leaving patterns. A new wintry season has arrived. (4) Snowflake Fairies with whirling skirts begin to fall, dancing and covering the entire landscape.